The Duncan Duo has always prided itself on being one of the Best Military Realtors in Tampa Bay having helped hundreds of active service members and Veterans buy or sell a home in Tampa Bay. Its an important part of our culture having team members that are Veterans as well as spouses and families of both Veterans and active duty Army, Navy, Air Force and Marines. Our owner, Andrew Duncan, is the son of a disabled Veteran and Purple Heart winner. His father Terry served as a Staff Sgt in the Army in Vietnam and lost his leg to a landmine and his brother Derrik is currently 100% disabled from service related injuries in the Army after stints in both Afghanistan and Irag as a Forward Observer / 13F. The Duncan Duo has also partnered with The Special Operations Warrior Project as a charity partner as a partner for its 2014 holiday open house in which The Duo raised thousands for the charity. They plan more housing education and charitable initiatives with SOWF in 2015. This dedication to serving those who help serve and protect us is one of the primary driving force’s behind the firm’s decision to relocate to just about a block outside of Macdill Air Force Base to 6320 S Dale Mabry Hwy in South Tampa. The firm’s dedication to Macdill AFB and our military show through clearly with our patriotic display of our company’s core values. With Florida being one of the most friendly military states, The Duncan Duo team at RE/MAX hopes to continue to be the #1 Tampa Bay Military Realtors and Macdill AFB Real Estate Agents. In the below video, Andrew talks about this move and what it means for the company’s future, its clients and its team members. 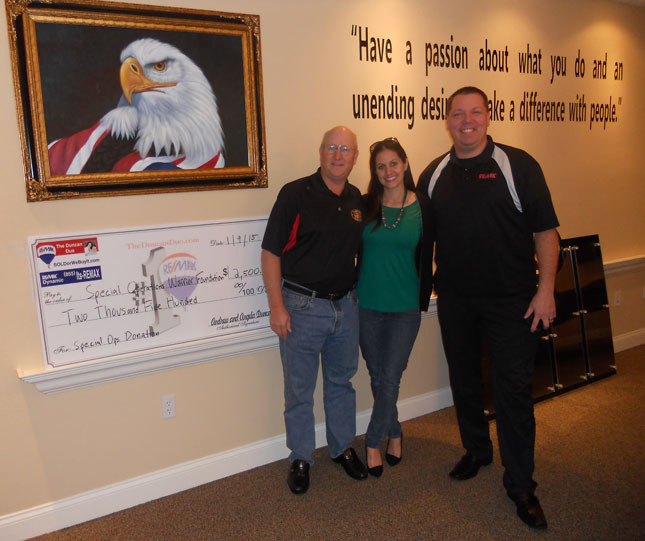 PROUD SUPPORTERS OF SPECIAL OPERATIONS WARRIOR PROJECT! WE DONATE $50 FROM EVERY ACTIVE DUTY / VETERAN CLOSING TO SOWF AND COORDINATE SPECIAL FUND RAISING EVENTS AT OUR OFFICE TO RAISE AWARENESS AND FUNDS TO HELP WOUNDED SOLDIERS! Below are video testimonials from current Macdill AFB active duty service members and those who were PCS’d out of Macdill who speak about their experience working the #1 Tampa Bay Military Real Estate Agents, who are now located just outside of Macdill Air Force Base. In fact, nearly every one of The Duncan Duo’s agents have received the prestigious MRP (military relocation professional) designation at the Greater Tampa Association of Realtors/National Association of Realtors – which is training focused on properly assisting a military home buyer or seller being PCS or relocated to another base. If you are PCS out of Macdill and need to sell your home quickly, trust the agents that many local and national celebs do, including Barbara Corcoran, Glenn Beck, Sean Hannity, Dave McKay, Ron Diaz and Jack Harris to Guarantee the Sale of your home in 29 days.